I just returned from a 3-week trip to Japan! My hubby and I went on a textile tour, led by Jerry and Carol Saber (you can find out more about their tours here). And if there was any doubt in my mind about the state of sewing in Japan, they have been all but vanquished! If you subscribe to Quilter’s Newsletter Magazine (or any other quilting magazine that covers quilting competitions and exhibits), you will no doubt notice that the Japanese seem to love detail in their prize-winning quilts. I can only imagine the hours and hours of meticulous cutting and piecing and quilting that go into these masterpieces. So it has been my impression that at least some Japanese love to sew! The focus of our tour was more on antique textiles and techniques. Shibori, indigo dyeing, and yuzen silk painting were all demonstrated to us and ample opportunity was given for purchasing such items. At least one member of our group enjoyed quilting with only silk. And all of us probably purchased at least 1 used kimono at a flea market with intentions of salvaging the silk for other uses at home. But with less emphasis on modern sewing in Japan, it was left to us to seek out the Japanese equivalents of Jo-Ann Fabrics, Hancock Fabrics, or our favorite boutique garment fabric store. Thankfully this was a trivial matter in Japan! For example, imagine you were interested in origami with an emphasis on kusudama (balls of paper flowers that can be hung like ornaments). There were periodicals dedicated to just this one origami form and there were numerous different issues of the periodical on the shelves. Same for, say, sewing bags with applique decorations. Or for sewing tiny fabric vegetables. The sheer number of books on all of these craft forms was overwhelming and I never did have time to go through each and every book as I had wished. Now let’s move on to general sewing stores. In Kyoto, we were staying very close to the Kyoto Train Station. There is an AEON Mall within easy walking distance of the hotel. This is a big, 4-story mall filled with shoppers at all hours. Unlike American malls, there are no unoccupied store fronts and there seems to be no down time. Shopping is alive and well in Japan! On the 4th floor, there are small restaurants and fast food (like McDonald’s and Kentucky Fried Chicken). I loved the Japanese version of a McDonald’s hamburger: beef patty, lettuce, egg, and mayo! But in addition to food, there was a novelty store (the kind of store that sells lava lamps), the 100-yen store (Daiso), a collectible card game trading store (think “Magic the Gathering), a small amusement area for kids (like a Chuck-E-Cheese), and… a craft store! They had fabric on rolls, sewing kits, fat quarters, sewing machines, a Scan-N-Cut, notions, sewing patterns (including a line from Simplicity), and no doubt many other things I failed to notice. They had so much stuff that some were mounted on racks that you had to slide to the side to reveal more racks. It was astounding (and pleasing). Why can’t we have such opportunities at our nearest malls? 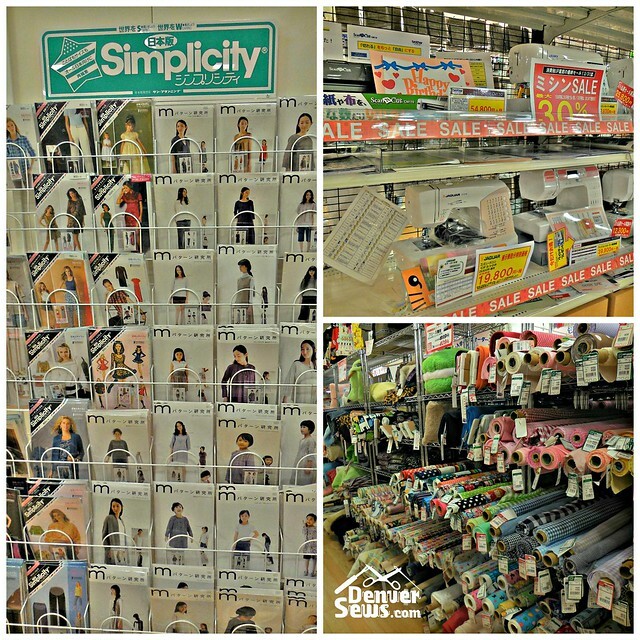 At the 100-yen store (Daiso), they had some sewing notions amongst all the other things you might expect at a Dollar General or Family Dollar store in the US. I found 3 different kinds of bodkins for 100 yen each and those D rings that we bag makers are constantly running out of. I bought the 3 bodkins and the D rings and left other stuff behind! This is at a 100-yen store! Let’s see, and on the North side of the Tokyo Train Station, there was another sewing store in the basement of the Tokyo Tower building. It also was crammed with sewing items. Mind you this is all within walking distance of the Tokyo Train Station! 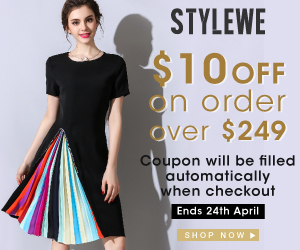 Let’s say you need some fabric for your next dress or top. If you’re in Tokyo, there is an entire “town” devoted to fabric. It is called “Nippori Textile Town” and is just off of the Nippori station. If you simply walk the 5 or 6 blocks down this street and back, you will encounter store after store of fabrics. Some stores specialized in quilting fabrics, some in fashion fabrics, some in older fabrics, some in leather, etc. It is absolutely overwhelming. 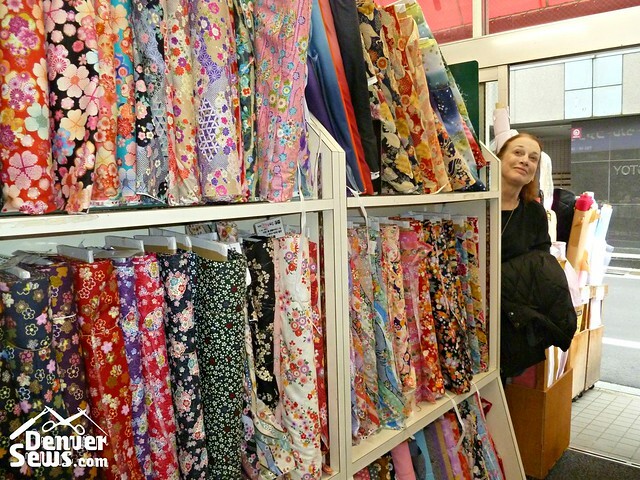 Our trip to Nippori Textile Town was on our last day of the tour and sadly we never had the opportunity to return to it or any of the other sewing destinations we had discovered. Had I known better, I would have made the effort to visit Tokyu Hands in Shibuya. Tokyu Hands is a chain of stores devoted to do-it-yourself. If I am to believe wikipedia, they have all of the following: toys, games, novelty items, gift cards, gift wrap, costumes, bicycles, travel products (such as luggage and camping gear), hobby materials, household hardware, tools, do-it-yourself kits, pet supplies, office supplies and stationery; calligraphy, painting, drawing supplies, furniture, lighting, home appliances, and storage solutions. 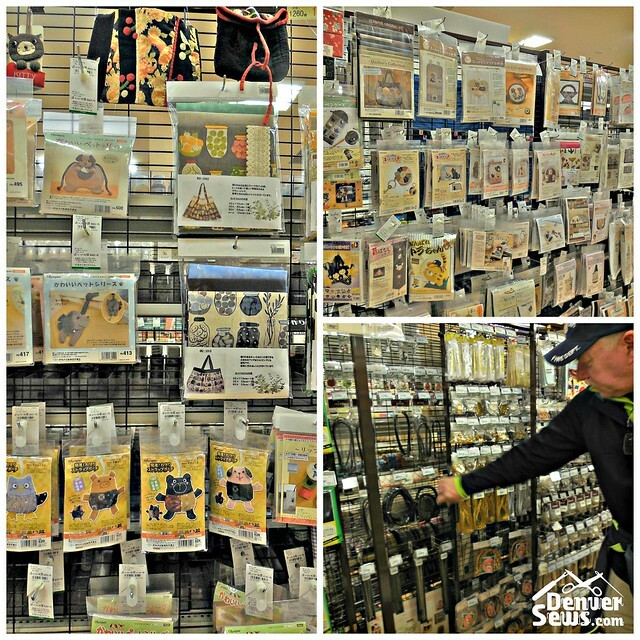 Oh how I would love to have Tokyu Hands in Colorado. And surely I could have found those “cute mechanical pencils” that my daughter wanted me to get for her! 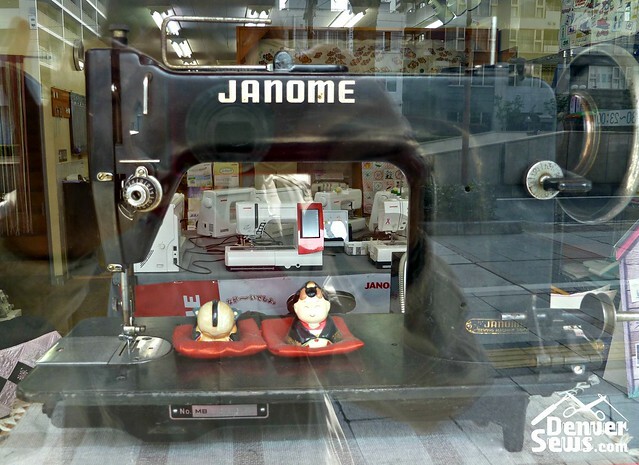 So if you believe that there is a correlation between what is offered for purchase and the level of interest in those items, I would have to guess that sewing is a much-loved hobby in Japan. And oh how I would dearly love to have such resources so close at hand. Which leaves only one conclusion: I will have to make another trip to Japan, this time with an empty suitcase at the ready! Textile Town? Textile Town?!!! I want to go to there! 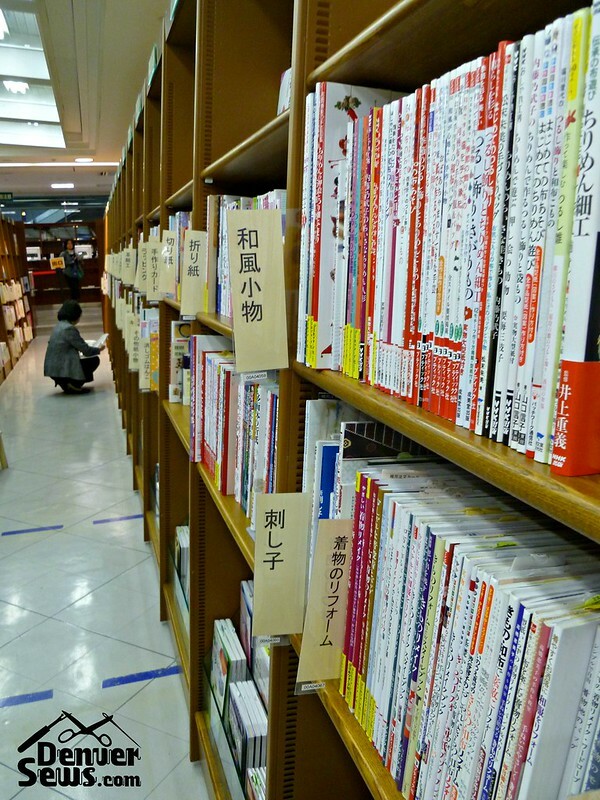 It’s interesting that DIY type stuff of all kinds is popular in Japan. I feel like as a lot of countries have shifted from manufacturing to service economies the interest of the population also shifts from making to consuming and that is why sewing has fallen out of favor even while people own more clothes. But apparently it is still cool to make things in Japan – I wonder where the difference lies? Wish the US was more like that! Anyways, thanks for the report, it was really interesting. I want to live in textile town. Maybe not, but I’d love to visit. Sounds like a trip of a lifetime!